This release has the DMM logo on the rear sleeve, lower left corner. Similar editions display the DMM logo on the front sleeve: Slave To The Rhythm (incorrect matrix printed on B-side label); Slave To The Rhythm (correct matrix on B-side label). Another similar edition has a different placement of the DMM logo on labels and can be found here. Distributed by Manhattan Records, a division of Capitol Records. * TM Owned by Antilles Communications Ltd.
** Manhattan is a registered trademark of Capitol Records, Inc.
℗ 1985 ZTT, distributed by Manhattan Records, a division of Capitol Records, Inc.
One of 80's brilliant LP from the phenomenal Miss Grace Jones . Exstensively Synclavier sound enhancing this fashionable Jones aura. Trevor Horn know how to exploit it . Work , live , love , breath , dance ...slave to the rhythm . 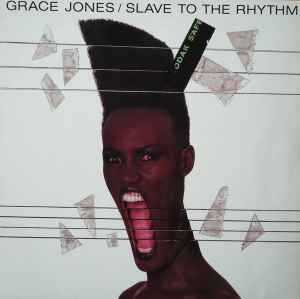 Breath , Blood and Voice : GRACE JONES !